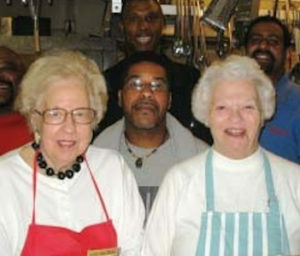 “Every Friday night for the past seven years, “The Golden Girls” have been serving dinner at the Mission. Mardelle Richey heard about the Mission through her church and brought along her friend Pat Beale. They have been Friday fixtures ever since. “I can’t tell you how much I’ve enjoyed helping the Overnight Guests-I just love it!” says Ms. Beale. “It satisfies me, and I wouldn’t dream of doing anything else on a Friday night.” Adds Mrs. Richey, “We both feel that we get more out of it than we could ever give.